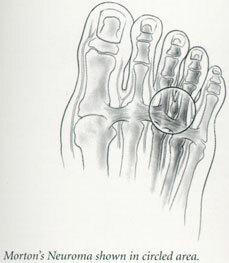 Morton’s neuroma is caused by a nerve being pinched. This pinching usually results in pain between the third and fourth toes. Tight shoes can squeeze foot bones together. The nerve responds by forming a neuroma, a build up of extra tissue in the nerve. The neuroma results in pain, that may radiate into the toes. Treatment usually involves wearing wider shoes and taking oral medications to decrease the swelling around the nerve. A pad on the sole of the foot to spread the bones is often helpful. Your doctor may also inject cortisone around the nerve. If your difficulty continues, surgery to remove the neuroma may be suggested.